Over the past few months I have been working with Dr. Robert Sainburg’s team in the Department of Kinesiology/Neurology at Penn State University. Robert’s laboratory and staff focus on the brain mechanisms that are responsible for planning and executing voluntary arm movements. We are working together in an attempt to retrieve additional arm function in my left arm while obtaining data for Dr. Sainburg’s team to further design and develop his arm movement tracking system called “Trackstar/Kinereach”. I believe that this technology could potentially be a real “game changer” for rehabilitation clinics when trying to maximize affected arm functionality. Dr. Sainburg’s laboratory focuses on examining movements in people with unilateral brain injuries in order to examine how each brain hemisphere contributes different things to motor control processes. In this respect, their team uses subjects such as me as a lesion model to learn more about the brain. On the other hand, they are hoping to develop a better understanding of how to train motor skills when one has either right or left hemisphere damage. For the PT’s, OT’s, and Neurologists out there, you will understand how huge this technology is for a person such as myself who has lost significant mobility in the arm due to stroke. For the rest of the TBI community who are desperately looking for technology that focuses on targeting the specific damaged areas of the brain in relation to arm mobility, this could be the future of occupational therapy. Today marks the 8th anniversary of my surgery. A friend of mine did a short video of my story and I figure today is as good a day as any to post it. Those who know me well know that my left leg and stairs do not go well together. I had a meeting today with a customer and this was the only route to and from the boardroom from the main level. Classic! 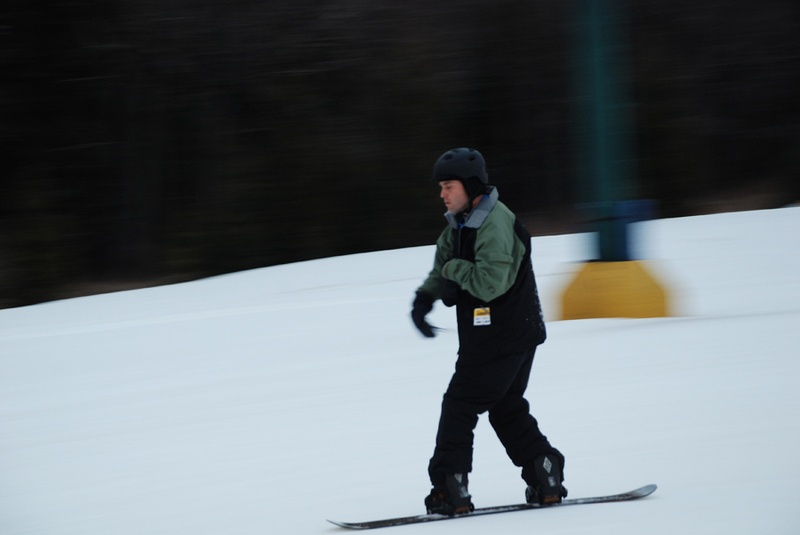 So I hit the slopes over the weekend to close out 2013. It was a much different environment from my experience last year. No beginner slopes and no slowing down of chairlifts this time around-The challenges of the day compiled rather quickly. I realized immediately that there is one huge difference between how I look at a mountain now compared to back in the day. Those long green runs look as intimidating as ever now. My left leg senses the threat of the slope grade as I stumbled off the chairlift at the summit. It is the same sensation that I felt when I learned how to walk down stairs again. The connection from my brain to my leg creates a sense of panic and the spasticity fires up immediately as I strapped into my bindings. There is a ton of trial and error in all of this. My right leg fatigued fast as it naturally tried to overcompensate for the left. By the end of the afternoon, my left leg was completely shot due to muscles, which haven’t fired, in such a long time. The transition off the chairlift is still a challenge but I did not need as much assistance with getting myself upright while being strapped to my board. All and all…it was a really good day. There are few things better than a day on the mountain. I’ll try to post some footage as well.